Its been a few weeks since I went on whirlwind tour of Europe, yet the perils of everyday life are already chipping away at my beloved memories. So I decided that its an appropriate time to blow the dust off this blog, and make my memories permanent, if nothing else they should give me a smile ten years from now. Our journey of three and half weeks took me to four countries and a dozen cities, from the beautiful Alps to the sparkling Italian coast, and we undoubtedly will cherish forever every minute spent in this adventure. Two words to describe Brussels – love it. It’s no coincidence that Brussels is the capital of the European Union, its the perfect combination of business, fun, attitude, and global embrace. If all of Europe gave a big group hug, you would be standing in Brussels. We landed there one Saturday morning, jet-lagged and all. Our hotel (NH Hotel du Grand Sablon), which was but a hundred meters from the central station, took us over an hour to find because all the streets look alike and are named alike. For the first time, we realized how addicted we are to our smartphones’ GPS, and the impossibility of figuring out directions in Europe, even with a map. We walked into three different districts, dragging our carry-ons on pebbled streets, asking anybody for directions, looking for any landmark. After walking over two miles, constantly soothing ourselves that the rest of the trip would be better, we found our hotel. The hotel itself was on a beautiful busy street filled with outdoor cafes and chocolate shops, with a small church right opposite and a large notre dame looming in the distance; we arrived well before the check-in time and had no option but to leave our bags and start being tourists for a few hours despite our intense desire to crash into any random bed. We set out to find a well known Pain Quotidien cafe in the area; given our ineptitude in following even the simplest of directions, we walked all the way around Rue Bodenbroek and up a long set of stairs and got a chance to see the law courts on top of a small hill; this was the first view of Brussels from an altitude. It was a moment of slight disappointment and anxiety for the view included no steely skyscrapers or ornate cathedrals, it was just a big city laid out in a slew of small colloquial buildings. When we finally circled back to the cafe, we sat at the communal table; and with us sat a Belgian couple and mother-child pair, it was our first encounter listening to french language conversation. As for the the French language, its both melodious and expressive, somewhat in the lines of the sing-song coimbatore-esque Tamil. 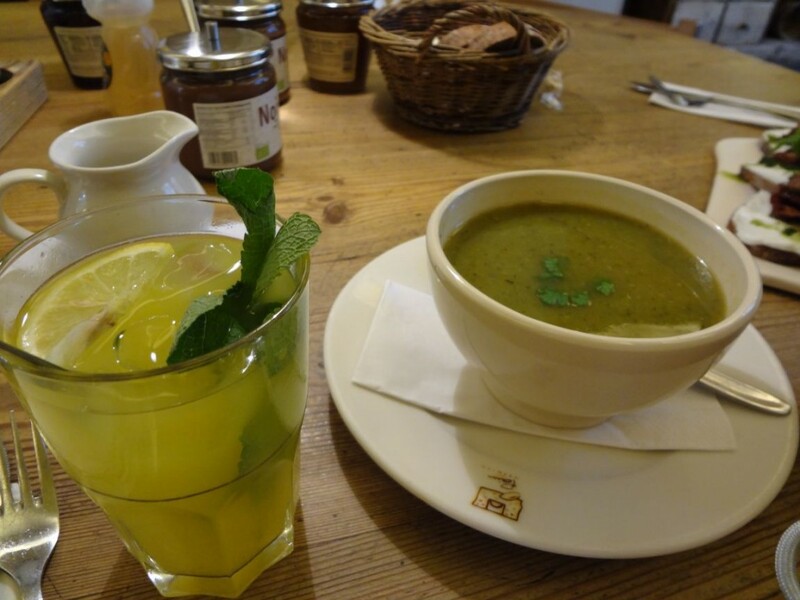 We a breakfast of zucchini soup (surprisingly good) and a goat cheese crostini (a little creamy for my taste), we headed out to explore the main sights of Brussels. Our first stop was the Notre Dame du Sablon, the grand church that overlooked our hotel and everything in the vicinity. 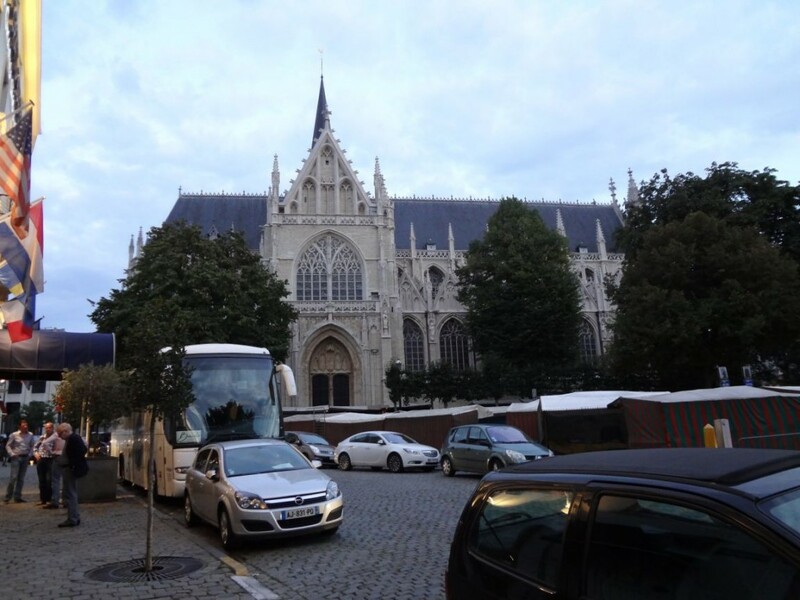 Though this was our first visit to a church in Europe, and we were definitely awed by the size and the interior, we have very little memories of it probably because we saw many grander churches the rest of the journey. 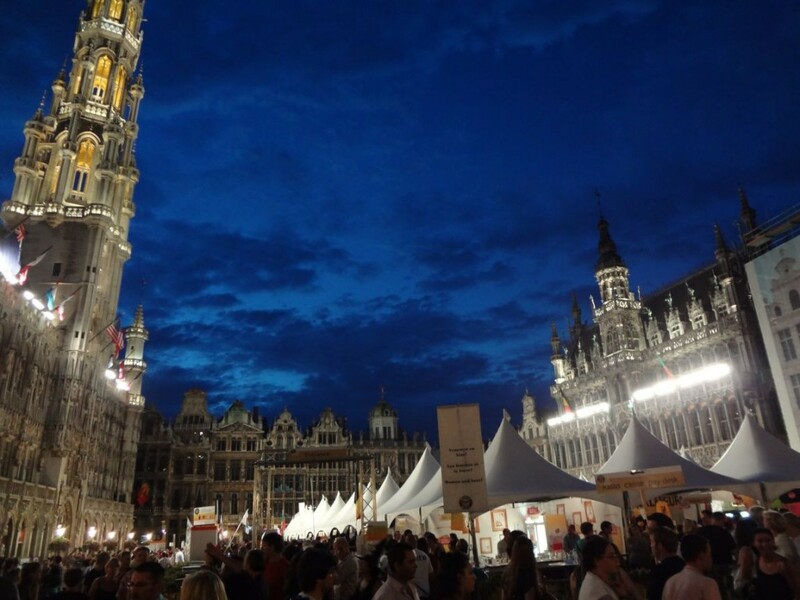 Then was the Grand Place market, a large square with gargoyle-covered gold-garnished buildings all around. Once a seat of power of the Belgian empire, now these beautiful and historic buildings house offices and shops. The grand place felt like it is popular not so much for its historic significance but for what it can host in its moderate size square. Like a little clay pot that can be used to cook anything, the square has been host to parties, fests, parades, and events over the centuries, making the local folk feel closer to the city and the state each time. On that day, the square was beaming with burly young men and giggly blonde girls, all inebriated by the beer varietals available at the beer festival taking place. I was but elated as I had been sulking the last few days that I was narrowly missing Oktoberfest in Munich, however I thought it would be wiser to not indulge until at least evening. We walked through a few back streets, each one filled with restaurants and cafes shouting out to tourists to come and taste the local delicacy – mussels and fries. 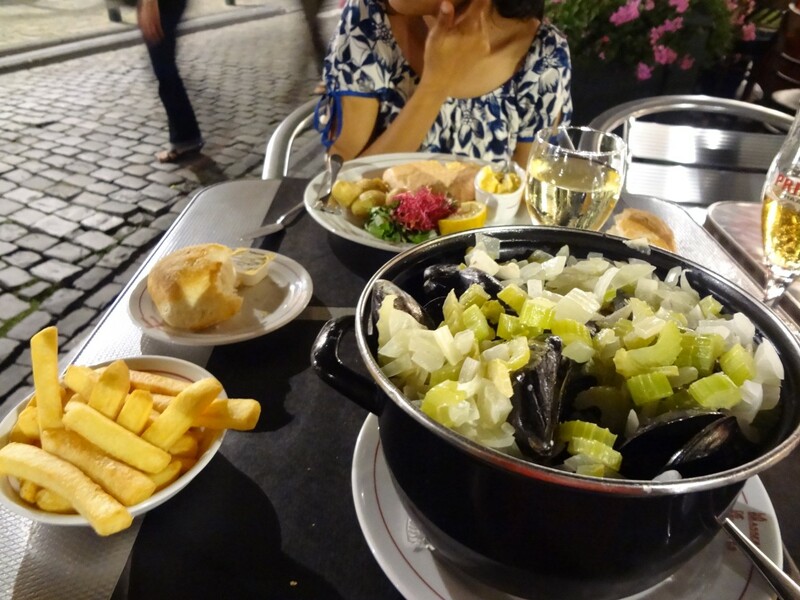 Every cafe in the vicinity of the grand place had the exact same menu of the three types of mussels, the same types of wait staff standing outside and shouting, and the same colors of tablecloths. We decided to keep to the golden rule of Europe travel, that you never eat anywhere near a landmark as those restaurants are only to pry a few dollars from unwitting tourists. 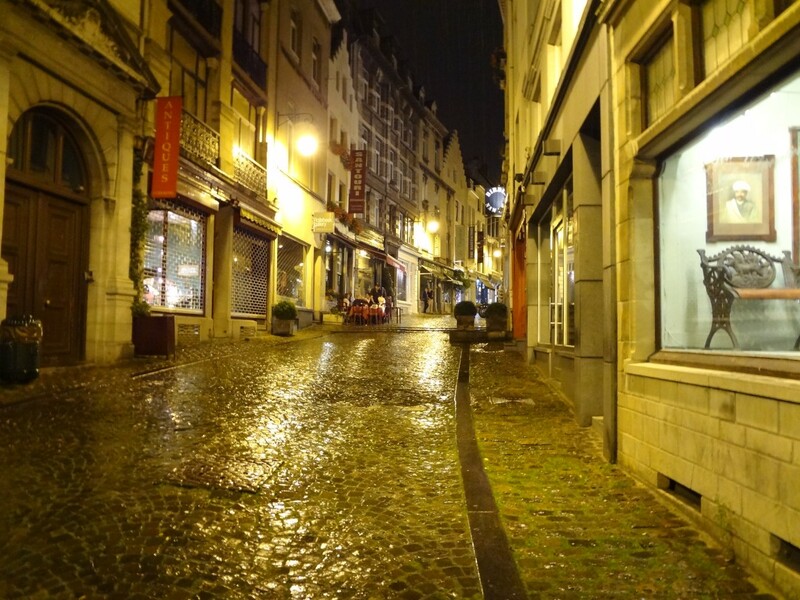 Just two corners down was the famous street featuring both of Brussels’ icons – the Mannequin Pis and Belgian waffles. The Mannequin Pis was much smaller and insignificant that we anticipated, its just a bronze statue of boy who purportedly saved Brussels by peeing on a small fire. Despite the size, people thronged all around the statue to see it pee, letting out ahas and oohs as if it they were collectively relieving themselves. The waffles didn’t feel as overrated though for I was still hungry from all the walking, there are about half a dozen waffle shops along the street, all flaunting similar combinations of waffles and condiments. The plain waffle was not bad, though I think any skilled waffler could make an equally good one back at home. Maybe its not so much about the statue or the waffle themselves, but its the experience, of watching the statue with a waffle, that is a quintessential ritual for every Brussels visitor. 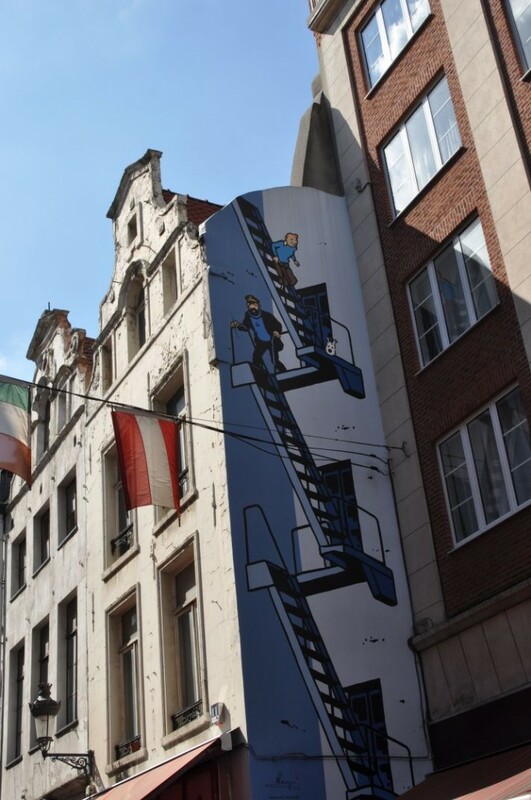 Just a block from the statue, I was overjoyed to see an entire side of a five-storied building covered in a Tintin mural. Though I haven’t read Tintin in a decade, the protagonist and the author’s name (Herge) were imprinted forever in my otherwise temporal memory. My wife apparently was holding on to this piece on information in order to surprise me. We kept our eyes out for more Tintin murals, but were too tired to continue our search beyond a few streets. On one of the larger streets, we ran into a union protest, which apparently is a common scene in most of Europe. We headed back to the hotel, a good twenty minute walk, and almost immediately crashed into a deep slumber. I woke up after only two hours, just as the sun was setting at 5pm; Anu was on the other hand, too tired to even budge.Beaming with excitement and anticipation, I was too anxious to lose any precious time on sleep. 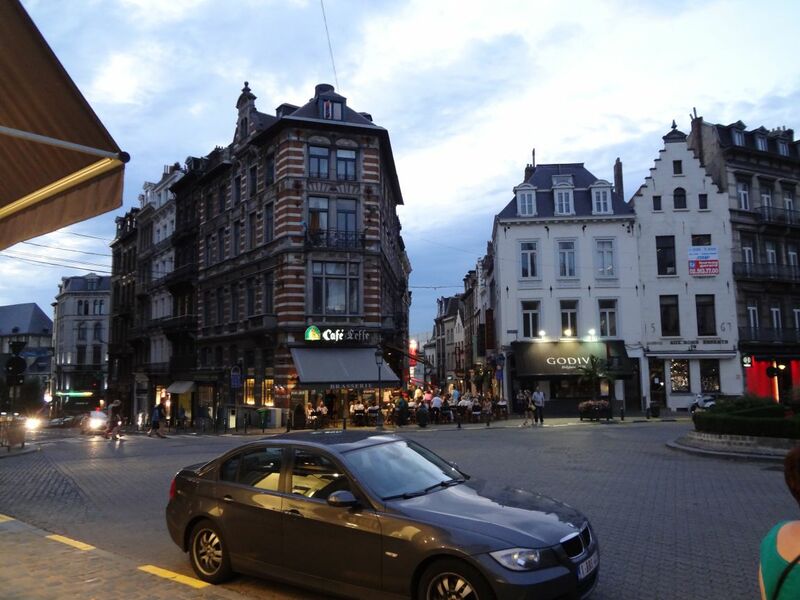 So I took a stroll by myself, down the street filled with cafes, all the way to the Grand Place. The evening was just setting in, and the deep blue skies made a unforgettable background for the majestic spires of the Grand Place. The beer festival was in high gear, and the bustle felt like an old European celebration with the clings of the mugs, the loud jokes and the loud house music in the background. It was a perfect juxtaposition of the calm above and the furor below. The bright lights and the blue skies twinged together to form beautiful shadows and glimmers on every surface. Though I couldn’t get into the beer fest, I got myself a table at a cafe on the side and took in my irst European celebration over a Duvel. Two hours later, I headed back to our hotel and took my wife back to the Grand Place, navigating the alleys like a local by now. 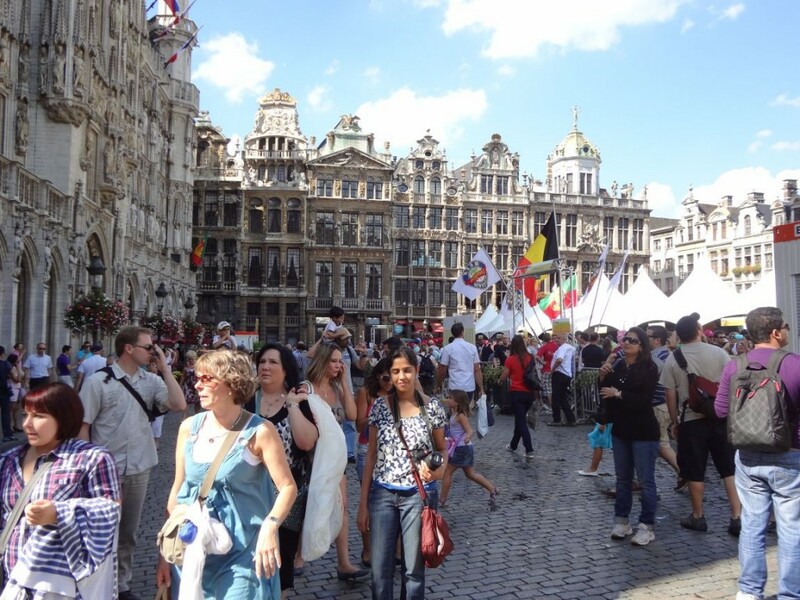 Though it was my third time at the Grand Place that day, it was no less exciting each time. After an hour of wandering, we decided to have dinner at a slightly more upscale restaurant a few blocks away from the crowds. We found a non-touristy restaurant called La Brasserie de Bruxelles on one of the streets heading back to the hotel; it was a small relatively empty little cozy place with about twenty outdoor tables. I have to say the one thing that I miss about Europe is the outdoor seating that is so prevalent there and yet hardly ever seen here. We probably never saw the insides of half the restaurants we ate at, the outdoors were always bustling, beautiful and naturally lit; in many ways it felt analogous to the natural way of indian eating i.e. with bare hands on banana leaves. Anyway, since this was the only time left in Brussels, we decided to delve into the mussels and fries before we lost our chance. The large pot of mussels in garlic wine sauce and celery was surprisingly delicious, the mussels were undoubtedly fresh, the celery was crisp and the sauce was balanced and flavorful. The fries on the other hand, though not as small and salty as american fries, were nothing out of the ordinary. And as were enjoying our first dinner in Europe, a viking god summoned the rain on us. And so we ran inside the little restaurant, glasses in hand as our waiter ran behind us with our mussels. We spent another hour eating, chatting and joking and left as the showers started to subside. 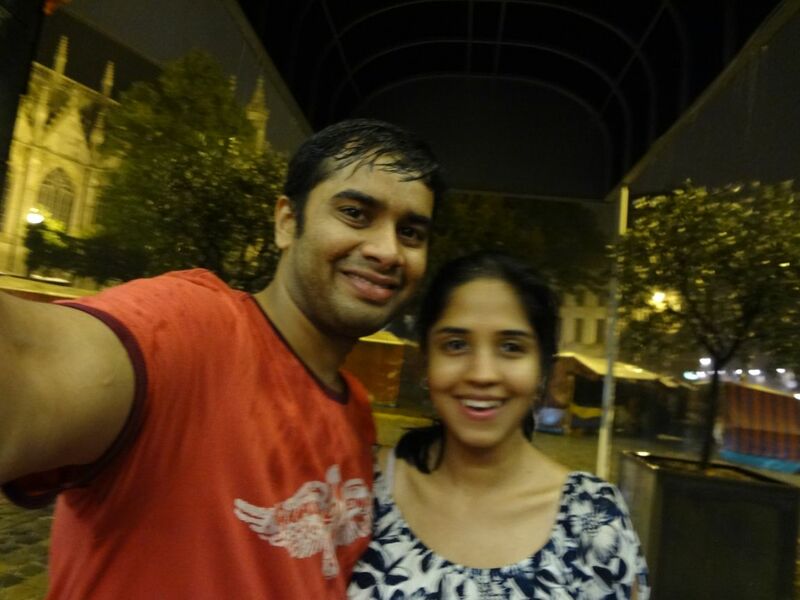 Just ten minutes into our walk back home, it started pouring again, and we jumped from random cafes and random awnings. After a few hops, we decided to stop at a small hole in the wall bar called La Malcour. 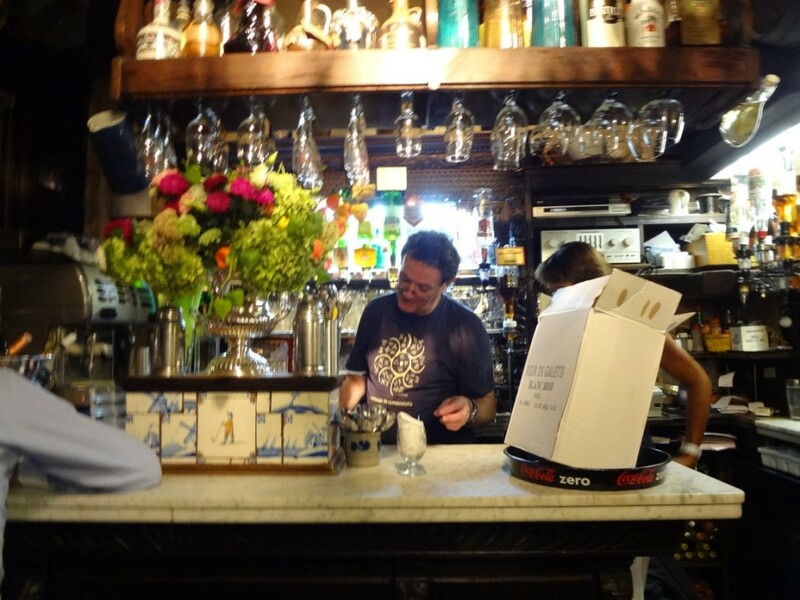 The elderly french gentleman behind the bar was straight out of an Asterix comic. There were seven other people sitting out the rain inside, but only one spoke passable English. I asked him the only question that was worth asking at that time, ‘Can you ask the gentleman behind the bar to give me the best Belgian beer available?’. They exchanged a few words and I was handed an Orval, the bar owner told me in broken English that this was a very special beer brewed by monks in a nearby monastery. And true to his word, Orval was like no commercial beer, for it had never seen the steel linings of an industrial storage tank or ridden in the back of a container truck. It was the closest to a perfect beer, a strong but not overpowering flavor, and a smooth finish that I have never seen again. This was the perfect ending to our first day in Europe, hanging out in a small bar, sipping an Orval, trying to make conversation with the locals, the rain pouring in the background.